Flareon 10/40GbE PCIe 3.0 server I/O adapters deliver industry-leading message rates with lowest latency and jitter over standard Ethernet along with low CPU utilization, enabling the industry's best performance and scalability for enterprise data center environments. Flareon server I/O adapters enable the deployment of more services to more users to fully leverage multi-core CPUs by providing hardware-assisted features to efficiently distribute I/O processing workloads, which eliminate bottlenecks, and optimize CPU utilization. Flareon server I/O adapters also provide application compatibility and protocol compliance, bypassing kernel and networking overheads, while featuring binary compatibility with standard APIs and applications. Flareon server I/O adapters accelerate high performance computing, Hadoop, cloud, grid, database, social networking, and virtualized data centers, as well as high frequency trading applications. 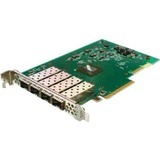 Flareon server I/O adapters with AppFlex™ technology provide a flexible platform for delivering multiple network services with a single server adapter. Flareon adapters enable selectively adding and controlling a wide range of services such as network monitoring, precision time, security, and application acceleration when deploying servers. Flareon PTP server adapters combine accurate host clock synchronization and precise hardware packet time stamping with the lowest latency at highest message rates - all in a single server slot operating over a single 10GbE network. Flareon server I/O adapters support PCIe 3.0 with ultra-low latency features such as direct packet transfer (TxPIO) mode which includes a templated send API. Flareon server I/O adapters reduce CPU load with hardware acceleration features that optimize packet delivery, such as UDP multicast replication, integrated layer 2 switching capability and VLAN insertion/removal, along with TCP segmentation offload (TSO).